A visit by Bob “Dr. 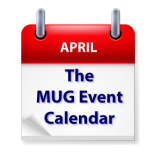 Mac” Levitus to an Illinois group and an explanation of Automator and Workflow by Adam Christianson highlight this week’s MUG Event Calendar. A Wisconsin group will discuss Gmail and Apple’s upcoming Photos is the lead topic at an Ohio group. Saturday 4-Apr Orange Apple Computer Club – What s InYour Maintosh Toolbox?